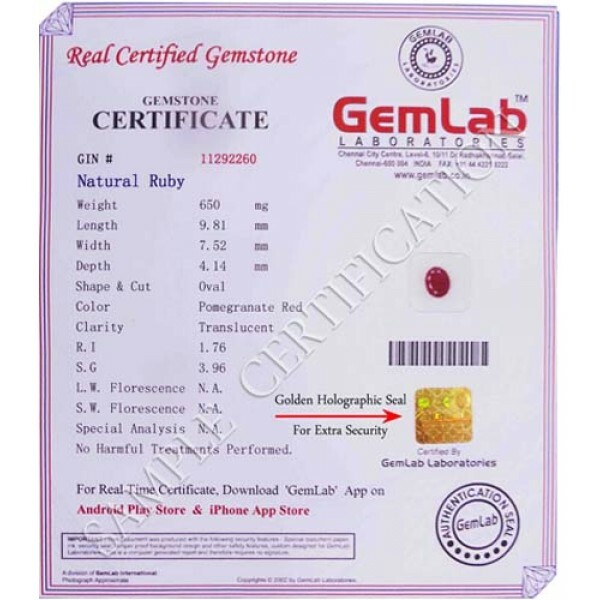 Ruby gemstone also is known as Manik in Hindi, has been a much-revered gemstone in Hinduism, for according to Vedic astrology, Ruby is the gemstone of Sun. Ruby gemstone draws inspiration from the Sun. The Sun holds a pivotal position in our culture and traditions. Ruby stone imbibes most of these qualities from the Sun, making it strong and much-revered gemstone by all. Wearing a ruby gemstone can benefit the wearer by begetting support from authority, administration. In medical astrology, wearing a ruby (Manik) gemstone can restore vitality and help in issues related to eyesight and blood circulation. One's communication will improve by wearing ruby gemstone.